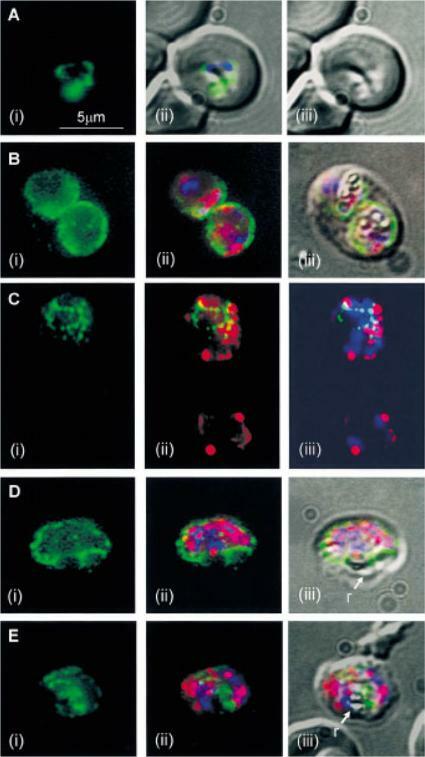 Fluorescent images of schizonts undergoing merogony (A–C), and four merozoites (D), labelled with antibodies to kinesin heavy chains (green) and a-tubulin (red), which labels the microtubules of f-MASTs, (merozoite assemblage of sub-pellicular mt) and DAPI nuclear stain (blue). A. Kinesin labelling is primarily associated with the residual body (r), but also radiates out in a series of linear arrays of discrete fluorescent points (Arrow) (i). Nuclei are shown by the DAPI staining (ii). 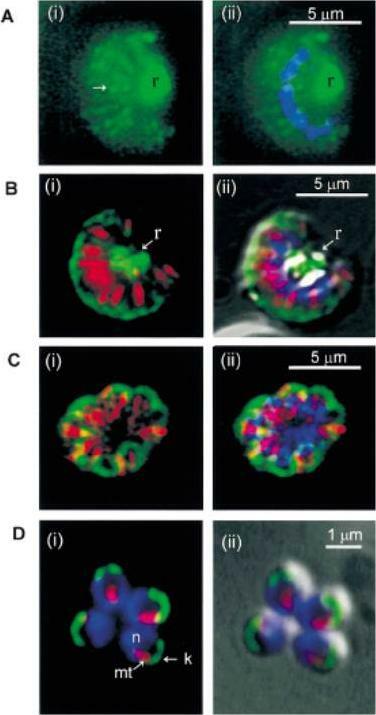 B(i), kinesin labelling is seen at the periphery of the schizont, where the merozoite apices lie, and in the residual body (r), which is distinguished by the white glow of the pigment seen in the overlaid DIC image (ii). C(i), kinesin staining is apparent only at the periphery of the schizont where the merozoite apices are located, and is not apparent in the residual body area. D(i), the nuclei (n) are situated at the base of the merozoites, the f-MASTs (mt) run laterally, and the kinesin labelling (k) appears to be located close to the membrane at the apices, as judged by its proximity to the cell surface in the overlaid DIC image (ii).Fowler RE, Smith AM, Whitehorn J, Williams IT, Bannister LH, Mitchell GH. Microtubule associated motor proteins of Plasmodium falciparum merozoites. Mol Biochem Parasitol. 2001 117:187-200.